When you open your aquarium cabinet doors, what do you see? 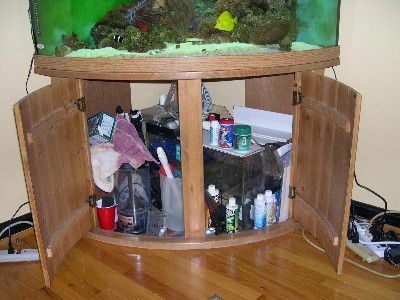 If your aquarium cabinet is like most other cabinets, it is probably a rat's nest of electrical wires, a dozen or so plastic bottles of various treatments, test kits, foods, supplements, nets, salinity testers, and other equipment. When you complete this project, your cabinet will be neat and tidy, and you will be able to easily find all of the "stuff" that you frequently use to maintain your aquarium as well as access your timers/power strips without having to move and dig through all of the "stuff." Remove everything from your aquarium cabinet. Untangle all of the wirings and trace each wire back to the light, pump, heater, etc. Locate a position on the side or back wall of the cabinet for your power strip/timer. Measure the distance between the anchor screw holes in the back of the power strip/timer and mark them on the location position in the cabinet. With a drill and a small bit, or a hammer and a nail, make the screw starter holes for the timer/power strip. Install the mounting screws, then mount the power strip/timer on the screws. This is usually easier to do without the wires attached to the strip/timer. Using a suitable length (as short as possible) extension cord (if required), install the power strip/timer and insert the plugs into the timer. You can put the coiled wires behind the cabinet, where they will be out of the way. Turn the breaker off for the aquarium equipment outlet and install the Ground Fault Circuit Interrupter (GFCI) outlet according to the included instructions. Turn the breaker back on and plug in your timer/power strip/extension cord. Cut each of the plastic soda bottles in half, leaving an approximately 1" by 1" tab at the top, then drill/punch a small hole in each one, about 1/2" from the top. This will be the hole for an attachment screw. You can use a staple gun to fasten the plastic bottles to the doors, rather than using screws. On the inside of the cabinet doors, locate the positions for the plastic bottles and hangars. Drill/punch each screw starter hole. Most cabinet doors have enough room to allow for 2 rows of bottles and hangars. If you have a sump, skimmer or other equipment in the cabinet, you will want to check to make sure that you will be able to close the doors completely without interfering with them. Replace all of your bottles of various treatments, test kits, foods, and supplements as well as nets, salinity testers, and other equipment in the plastic bottles on the cabinet doors. If you still have small "stuff" in your that won't fit into the door storage units (plastic soda bottles) you can put a set of suitably sized plastic storage drawers in the cabinet. The plastic storage drawer units are very handy for storing all of the little loose items that are always getting lost on the bottom of the cabinet.